Here on the Plaza College Blog, we try to provide students with the tools and advice surrounding issues that commonly arise during their college careers. Outside of our blog, several resources exist to provide the same sense of direction to students all over. One main resource, collegerecruiter.com, addresses a variety of issues that college students face, as well as commonly asked questions. Here are some links to helpful articles that address recent topics discussed here on the Plaza blog. Marketing yourself effectively via social media has been a main topic lately on the Plaza College blog. Why? Social media has become such a rapidly advancing technological phenomenon, that virtually any industry you can think of utilizes it. It is important to know the in’s and out’s, along with the do’s and do not’s of social media marketing in order to stay on top of the competition. Click here to view an infographic with a whole perspective on rules for effective social media marketing strategies. With classes resuming tomorrow, Plaza College would like to reiterate the importance of our students’ academic success and personal well-being. Our student body is our top priority here at Plaza. So, with this recent tragedy impacting so many of us, our goal is to cater to the needs of our students with steadfastness and pride. In light, do not stress over the missed days of class! Everyone is on the same page as you, and Plaza College professors are going to ensure that each student completes the Fall 2012 semester both successfully and on time. Dean Marie Dolla has composed a small list of things to do before returning to classes tomorrow morning. Review the following list, and getting back into the swing of things will be a breeze. 1. Pull out your class syllabi, and refresh your minds as to where each class currently stands. 2. Check in with your professors via email and see if there is anything you can do this week. 3. Keep up with any reading assignments. 4. As we say on our course outlines, for every one hour of instruction, there should be two hours of homework or studying. Welcome back students! Time to buckle up and continue on with a great Fall semester! A photo of Brooklyn, NY taken today, courtesy of weather.com. Hurricane Sandy, also known as “Frankenstorm,” is expected to bring on high winds and floodwaters to the mid-Atlantic region. Plaza College has already taken precautions to prepare for this storm by closing campus for Monday, October 29, 2012, as well as Tuesday, October 30, 2012. We hope that everyone has prepared, and is continuing to take caution, while we take this storm head on. Here is some advice for extra steps towards preparation. Hopefully you have covered this step already, as it is probably best to stay under shelter at this point. Make sure you have all necessary supplies in the case that your home loses power, or the water is shut off. Essential supplies might include bottled water, unrefrigerated foods that do not require heating, flashlights and candles. 2. Board windows and lock the doors. If you are close to the shore in the tri-state area, you should be advised that the high winds and rough seas are going to be tough to handle. Already, severe flooding has been reported along several shore towns. If you are in danger of flooding in your area, it may be necessary for you to board the windows. For those who are taking shelter further inland, you should close and lock all doors and windows in your home. Due to the heavy storms and high winds, it is also important to stay away from the windows as best possible. To avoid further damage outside, anything that can be picked up by the wind should be moved to a secure location. 3. Make sure that your whereabouts are known. You should let friends and family know exactly where it is that you will be taking shelter in the case of an emergency. If you need help, or have found safety, it is important to notify someone. 4. Ensure that your car is filled with gas. In the case of evacuation, it is important that you and your family have a mode of transportation you can rely on. Again, at this point it is best to remain indoors. If you are concerned about the possibility of evacuating, but do not have your own transportation, you should contact friends or family to make travel arrangements for your safety. The New York and New Jersey transportation systems have been shut down in preparation for this hurricane. 5. Refrain from opening the refrigerator. In the case that the power goes out, you should prepare a cooler of drinks and other food products. Opening the refrigerator will release the remaining cool air, and could possibly lead to a fridge full of spoiled foods. We cannot predict the length of a power outage, or how long it might take to fix the problem. Preparing for the worse is best in these circumstances. These steps are only the beginning to many. Click here to see more from CNN and the American Red Cross. 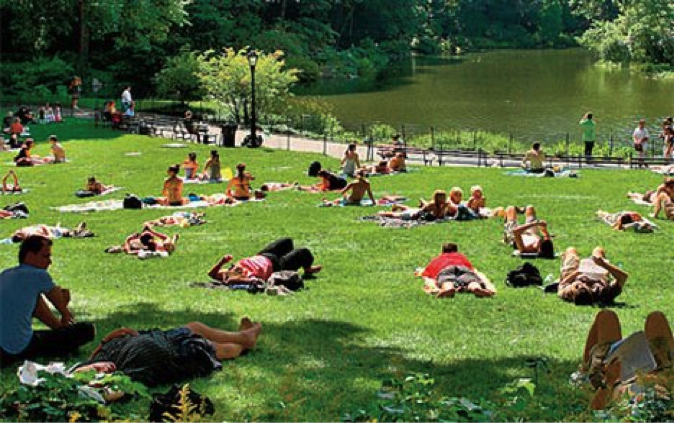 New Yorkers enjoy a summer day on a small part of Central Park’s vast 843 acres. It’s typical behavior for New Yorkers to flee the city at once on Friday afternoons in the summer, heading out to the east coast for a weekend along the shore. The question we’re asking is: Why not beat the traffic and enjoy all that NYC has to offer? That’s right, summer in New York City is actually the best season to complete that bucket list of places to go and things to do while in the most populous city in the US. Sure, the sun is hot and the humidity is thick at times, but there is an extensive list of things to do and ways to beat the heat during the hottest days of summer. So many people tend to forget New York City’s 14 miles of beaches and don’t take advantage of the chance to sink their toes into the sand locally, while avoiding the gridlocked highways. Staten Island offers a handful of beautiful beaches with boardwalks, fishing piers and acres of sand that are less popular than the tourist attractions of Coney Island and Rockaway Beach. If you’re not a beach lover, NYC is home to 55 outdoor pools within the park system, and some are gigantic, like the McCarren Park Pool, which recently opened in late-June for the first time in 25 years. The best part about most of the activities that the parks department offers: they’re free! That’s right, the swimming pools and beaches are free! Nothing beats a priceless day of fun in the sun and sand with friends and family, right? 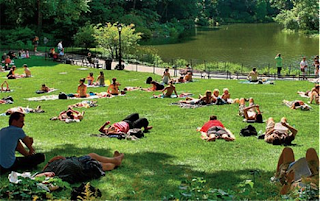 Aside from water activities, summer in NYC offers the opportunity to catch a concert from the diverse group of musicians at the SummerStage in Central Park, or to finally catch that show on Broadway you’ve been waiting to see. “NYC Restaurant Week” is another advantage of spending the summer in the city. It starts July 16thand extends into August 10th, offering great deals at eateries across the five boroughs. Plan a special night with friends or a loved one and head to dinner at a participating restaurant within walking distance to Central Park. Temperatures are perfect during the evening hours of the summer months, making your walk through the city or Central Park a unique and intimate experience. With so many activities to consider, will you take advantage of NYC this summer? Astoria Planning to Build The First Outdoor Movie Studio Lot in NYC! 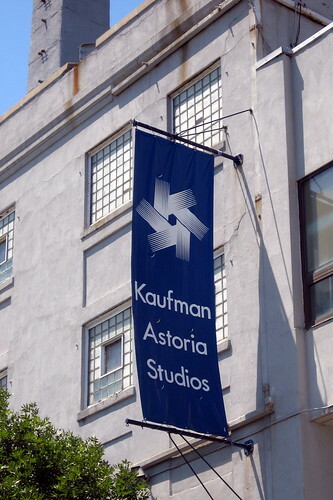 Kaufman Studios in Astoria has planned an expansion to build an outdoor movie studio lot, which would be the first outdoor lot in New York City. The project is in review for the second time, as it’s been stopped once before. Senator Charles Schumer is all for the project and is urging the National Park Service (NPS) to authorize Kaufman’s proposal for the expansion. Expansion would start by enclosing 36th Street between 34th and 35th Avenues within the lot and construct an entry gate at 36th street and 35th avenue in Astoria. This would create a “studio campus” comparable to the ones seen in Hollywood. The new outdoor studio campus would allow for filmmakers and production companies to film outdoor exterior and special effect shots directly adjacent to the interior sound stages. This would allow for more movie and television clients to pick the location because it would accommodate all of their needs. Many choose other locations instead for interior and exterior location convenience. In 2010, Kaufman Studios spent $23 million on an indoor studio. The president of Kaufman Studios, Hal Rosenbluth, is excited for the project and believes that it will add much growth to the studio industry in New York and economic development in the neighborhood. Schumer is hoping that the project will be in the works soon and completed by the summer of 2013. What do you think about the expansion of Kaufman Studios? Do you think it will benefit the area? Let us know what you’re thinking on Plaza College’s Facebook page linked here! Spring has finally sprung! This is a great time of year to get outside and get active while enjoying the beautiful sunny, warm weather. Here is a “spring to-do-list” with some fun ideas and thinks to look forward to over the next couple of months! 1. Spend time in the garden. Gardening is a great way to connect to the earth and watch something new grow from a seed into something wonderful. 2. Spring clean. Rid your home of the clutter and enjoy some new light and airy space. 3. Go to a farmer’s market. If you’re unsure if there is a farmer’s market in your area, LocalHarvest has a great database of farmers’ markets across the US. Farmers’ markets are great gathering places and give you the perfect opportunity to support local farms and businesses. 4. Invite friends over for brunch. Spring is great season to host. A mild, spring morning is an ideal time to spend time with friends and enjoy a meal together. 5. Cruise around town with the windows open and music on. Simple but fun! There is nothing better than rocking out to your favorite new cd and feeling the cool breeze on your face. 6. Look up new recipes. Spring is a great time to incorporate fresh ingredients into your recipes. Try using some seasonal vegetables in your cooking to keep things new and exciting! 7. Take a day trip. Be spontaneous. Take advantage of the short span of mild weather of spring and go somewhere new and unique. Whether it’s a short car or train ride away, do some research and think outside the box. Also, consider incorporating a hike into your day or even a picnic. What’s your favorite thing to do in Spring? Tell us on the Plaza College Facebook wall! NYC’s St. Patrick’s Day Parade 2012: Everything You Need to Know! The New York City St. Patrick’s Day Parade is one of our city’s greatest traditions. The first parade was held on March 17, 1762 – fourteen years before the Declaration of Independence was adopted – and has marched its way to the largest parade in the world today! The first St. Patrick’s Day Parade in New York was held on lower Broadway by a band of homesick Irish ex-patriots and Irish military who served with the British Army stationed in the American colonies. For the first few years of its existence, the parade was organized by military units. After the War of 1812, the Irish fraternal and beneficial societies took over the duties of hosting and sponsoring the event. Originally, the Irish societies joined together at their respective meeting places and moved in a procession toward Old St. Patrick’s Cathedral in Lower Manhattan on Mott & Prince Streets, where the Archbishop of New York would address the crowd before revelers dispersed to celebrate. falls on a Sunday, it is celebrated the day before, Saturday the 16th due to religious observances. 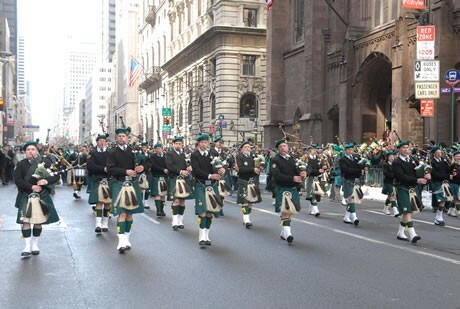 The parade marches up Fifth Avenue past St. Patrick’s Cathedral at 50th Street all the way up past the American Irish Historical Society at 83rd and the Metropolitan Museum of Art at 83rd Street to 86th Street, where the parade finishes at around 4:30 – 5:00 pm. Your best bet is to leave your cars at home and take an MTA train or bus to New York City to join the St. Patrick’s Day festivities. Some of the best viewing spots are on the upper steps of the Metropolitan Museum of Art and 86th street, where the parade ends and the marchers disperse. This is an especially great spot if you have children with you would like to meet some of the many police officers, firefighters, and other participants! Are you planning on attending this year’s St. Patricks Day Parade? Tell us on the Plaza College Facebook Wall, linked HERE. The ING New York City Marathon will be aired on live national television in 2012 for the first time in almost 20 years, announced today by WABC-TV/ESPN and NYRR officials. The Marathon will be televised live nationally on ESPN2 and accessible through ESPN from 9:00 a.m. to 12:30 p.m. ET/6:00 to 9:30 a.m. PT, and in New York on WABC-TV and 7online.com from 9:00 a.m. to 2:00 p.m. That same afternoon, ABC will broadcast nationally a two-hour Marathon highlight show. The agreement begins with this year’s event on Sunday, November 4. The extraordinary partnership will also highlight coverage of ING New York City Marathon weekend events and other marquee NYRR races throughout the year. The deal reunites NYRR with ABC, which carried the first live national broadcast of the Marathon in 1981 and where it aired until 1993. “The ING New York City Marathon is one of the greatest spectacles in all of sport, and today’s announcement is a huge step forward in bringing all of the event’s passion and excitement into homes, live, across the country,” said Mary Wittenberg, president and CEO of NYRR and race director of the ING New York City Marathon. The first New York City Marathon was held in 1970, with 127 competitors running multiple loops around the Park Drive of Central Park. 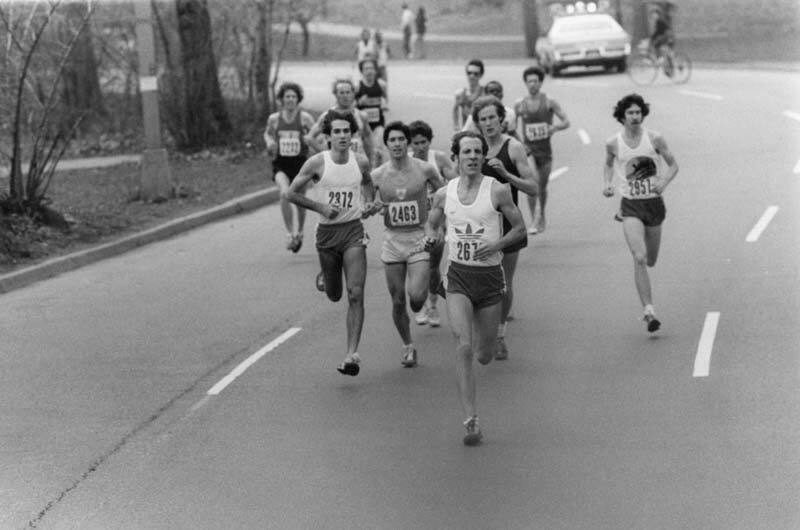 Only about 100 viewers watched Gary Muhrcke win the race in 2:31:38. Their were a total of 55 runners that crossed the finish line. Since then, the marathon grew larger and larger and incorporated all five boroughs of New York City. Two years late Norwegian, Grete Waitz, broke the women’s world record, finishing in 2:32:30. An official wheelchair and handcycle division was introduced in 2000, and starting in 2002, the elite women are given a 35 minute headstart before the elite men and rest of the field. The New York City Marathon has now become the largest marathon anywhere in the world. Each year nearly two million cheering spectators line the course from all different neighborhoods of New York. On October of 1492, Columbus sailed the ocean blue, and landed in the America’s on October 12th. The holiday is celebrated as Columbus Day in the United States, as Dia de la Raza in Latin American countries, as Discovery Day in the Bahamas and as Dia de la Hispanidad and Fiesta Nacional in Spain. From parades and street fairs to quiet gatherings and memorial services, Columbus Day has been celebrated differently all across the world since the early 18th century. NYC will host its annual Columbus Day Parade on Monday, October 10, 2011, beginning at 11:30am. The parade begins on Fifth Avenue at 44th Street and continues north along Fifth Avenue to 79th Street. The Columbus Day Parade has been organized by the Columbus Citizens Foundation in New York since 1929. The parade attracts nearly one million spectators and is the largest celebration of Italian-American culture in the world. Over 35,000 people participate in the NYC parade each year, including over 100 groups, bands and floats. Since 1971, Columbus Day has been celebrated on the second Monday of October. School districts, banks, the bond market, US Postal Service and other federal agencies and most state government offices recognize the holiday and observe. So, gather up your friends and family and celebrate Christopher Columbus’ settlement in the America’s 519 years ago on Columbus Day 2011 in NYC.